More than 30 years experience in Balloons. Our brief History. 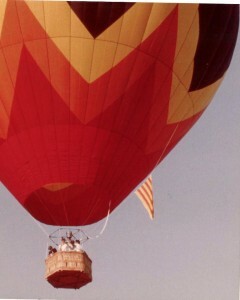 We started flying balloons in 1978 with a used balloon. Straight after this we designed and built our own much bigger balloon for an expedition to Africa. This trip in 1980, lasting 11 months, involved 40 flights and was from Zanzibar (Tanzania) to Kisiangani (Zaire). In this adventure we were Josep M Lladó, Jaume Llansana and Joan Comellas. After this trip we started designing and building an Ultralight aircraft and created Ultramagic S.A. However during the Ultralight period, news had spread about our building a balloon for the Africa adventure and more and more people started asking if we could build one for them. We had the experience of building balloons still had the sewing machines and had the Aeronautical organisation, so for strategic reasons, Ultramagic Ultralights became Ultramagic Balloons. This was the beginning of a long story and we have now built thousends of balloons which fly and operate world wide. The annual production has now increased to between 80 and 100 balloons with approximately 80% being for export. Exporting to every part of the world including Japan, North America, South America, Europe and of course where it all began – Africa. Ultramagic Balloons are now firmly established as the leader in balloon design and are one of the largest balloon manufacturers in the world. In 1993 we started a division for cold air inflatables which quickly became successful with over 4000 built to date. The annual production of inflatables is now averaging over 250 units. The business has carefully grown to accommodate its success and we now have over 40 qualified and dedicated staff working at our purpose built factory as well as having a worldwide network of dealers offering customer support.